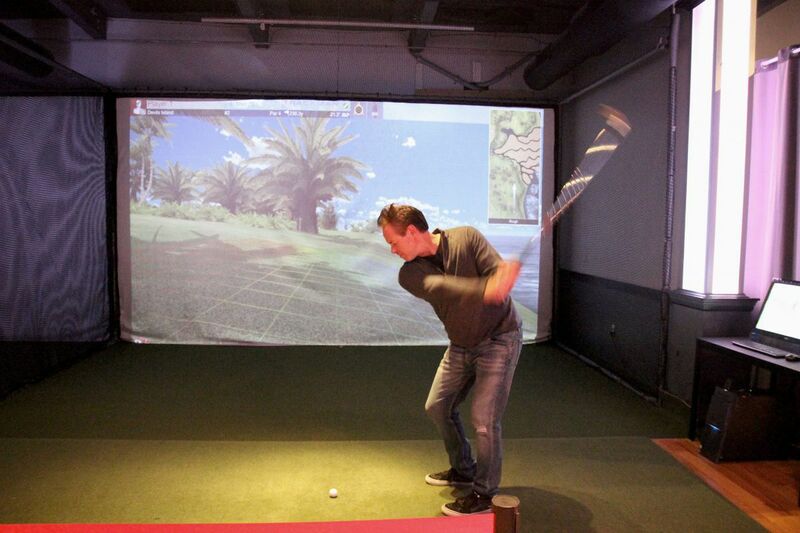 Owner Rick Troost takes a swing at a golf ball in one of his 18-foot-wide simulators at Golf & Social, 1080 N. Delaware Ave.
Sports such as bowling and Ping Pong get the bar/restaurant treatment. Now add indoor golf, with Golf & Social (1080 N. Delaware Ave.), in the softest of soft-opening modes across from SugarHouse Casino in Fishtown. G&S had a year's run in Marlton before moving into the short-lived Johnny Mañana's recently. The main bar at Golf & Social, 1080 N. Delaware Ave. It's open from 10 a.m. till the last duffer quits (it's about $55 an hour to play one of 87 famous courses on the four 18-foot simulators). G&S boasts a roomy, well-stocked first-floor bar as well as the second-floor game room with billiards, foosball, and golf simulators, where you line up and tee off into a screen. Menu is mainly pub fare — hey, that's par for the course — but owner Rick Troost says it's due to expand. So is the club itself: The third-floor deck will hop next spring with revelers who will get two birdie's-eye views — SugarHouse and Ben Franklin Bridge to the east, and Center City to the west. Note: If you're driving south on Delaware Avenue, the parking lot is before you get to the front door. It's across from SugarHouse's north driveway. Pop "1100 N. Delaware Ave." into your GPS to hit the pin. SugarHouse Casino and the Ben Franklin Bridge, as viewed from the roof of Golf & Social at 1080 N. Delaware Ave.